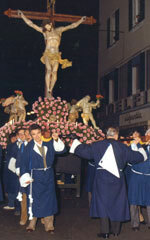 The Procession of the Good Friday of Savona is an ancient medieval rite in Christian tradition. Devoted Christians, interested tourists and many other people come to see this religious rite, that is held every two years. The procession starts from the cathedral and goes on for about one kilometer and a half until it arrives to the Torretta di Savona ("Tower of Savona"). Many years ago, the procession was moving through small, narrow alleys, but now it takes place in the wide bright streets of Savona. The procession opens with a Crucifix made of wood called in dialect "Cruxe du Pasciu", and ends with the Shrine of the Holy Cross. In between there are thirteen more wooden "boxes" that represent the life of Christ. In the early age, the priests who held boxes on their shoulders, had hoods on their heads in order to stay anonymous, but now their hoods are put down on their shoulders just in a symbolic way. It is organized by the six Confraternities of Savona. The procession is accompanied by motets especially composed for this occasion. 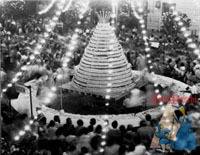 This is one of the most beloved religious rites of Savona. Every first Sunday of August, since 1925, is reserved for the famous "Palio del Golfo"( the Race of the Gulf of La Spezia). It is the traditional boat race of Liguria that is held for the manifestation Festa del Mare. Thirteen boats from thirteen different marine fractions take part to this race. Each one of them has its own number: Portovenere (1), Le Grazie (2), Fezzano (3), Cadimare (4), C.R.D.D.-La Spezia (5), Canaletto (6), Fossamastra (7), Muggiano (8), San Terenzo (9), Lerici (10), Tellaro (11), Venere Azzurra (12), Marola (13). The race is 2 km long and it takes about 10 minutes for the participants to finish it. Usually, on the day before the race, there's a traditional theme parade under masks to which all the marine fractions take part. The gulf in these days gets another dimension, it's very cheerful, and a lot of people come here to enjoy this traditional event! Sanremo in Fiore (Blooming Sanremo) is a famous festivity in this marvellous Ligurian city. It was held for the first time in January 1904 under the name of the Celebration of the Goddess Flora. It is organized as a wonderful parade of coaches all decorated with fresh flowers. After the War, the celebration changed its name into the "Blooming Italy". The parade is accompanied by many music bands and folkloristic groups. It's interesting how preparations for this show last for a few months and it all finishes in one night so that the flowers stay fresh! Definently the show to visit! Funny name and fun festivity indeed. La "Torta dei Fieschi" (Fieschi's Cake") is a traditional celebration of Lavagna, a town located in the province of Genoa. Every year, it takes place on August, 14th. This show is a representation of a wedding that was supposedly held in 1230 between Count Opizzo Fiesco and Bianca de' Bianchi. It was never acertened that this wedding really happened. But it doesn't matter, because all the inhabitants of Lavagna do love this spectacle. Participants wear old costumes and they have fun as they were at a real wedding. The parade passes through the streets of Lavagna bringing music to every corner. At the end, we arrive to the reason for the name of this celebration. When the parade gets to its end at Piazza Vittorio Veneto, the huge cake is served to the guests of this show! Yummy!